A number of car factories are at risk of closure because of overcapacity in the European auto industry. PSA/Peugeot-Citroen's factory in Rennes, France, and Honda's plant in Gebze, Turkey, are highest on the list, according to France-based research firm Inovev, which estimates that each plant's capacity usage was below 30 percent last year. "Honda is having difficulty positioning itself in Europe, so I think they would be happy to close that plant," Inovev CEO Michel Costes said. Honda makes the Civic in Turkey. The Japanese automaker recently announced that it will cut a production shift and 340 jobs in Swindon, England, where its largest plant in the region is located. When asked about Rennes, where PSA makes the Citroen C5 and Peugeot 508, Costes said: "We cannot understand why that plant is not closed. It is not well positioned from a logistical point of view." PSA announced late last year it would make its replacement for the 5008 compact minivan at the plant in 2016 (the current 5008 is made in Sochaux, France). Costes said the plan for Rennes could be changed given that PSA has time, a new management team and new stakeholders. The other at-risk plants include Fiat’s Mirafiori factory in Turin, Renault’s plant in Sandouville, France, and PSA’s facility in Villaverde, Spain, Costes said. What the plants have in common is that they are all due to get a new model, or models, that could turn around their fortunes. 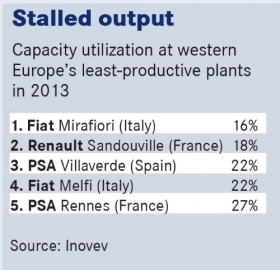 Mirafiori was Europe’s most under-utilized car factory in 2013, running at 16 percent capacity, according to Inovev data. Most of its workers are on temporary layoff. The plant, however, is expected to be revived when it starts making the Maserati Levante SUV in 2015. It also is likely to produce an SUV for Alfa Romeo starting in 2016. Renault’s Sandouville plant ran at 18 percent capacity, but it is supposed to get a boost from the addition of the Trafic. Production of the commercial van started this spring ahead of its summer debut. The factory also makes the weak-selling Espace and Laguna. PSA’s utilization rate at its Villaverde plant was 22 percent in 2013. Costes said the factory’s rebound will depend on the success of the new Citroen C4 Cactus.